Karamilk is 21-year-old singer/songwriter Erin Foster. Erin is a student spending her time between Sydney and the Gold Coast while writing her feelings as a healthy alternative to eating them. Over the last 5 years she has recorded hundreds of demos as a means of escaping a lonely teenage-hood. Growing up inland from the North Coast of NSW, she was homeschooled alongside her younger brother while living 60 minutes from the closest town. The silence created thoughts and then the thoughts created anxiety. Writing songs was how she learned to escaped the noise of everything. 2018 was a year of recording and producing her best works alongside her best mates. 2019 will be a year of releasing, performing and connecting with people who understand her works. 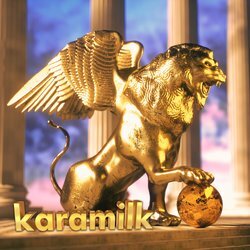 Gone, the debut single from Karamilk. Full of energy, girly, dancy, unashamedly pop.